Box Text: It's Sega 1st special edition game. You won't find this version on the store shelves! Your planet has been overrun by the meanest mutant vegetation ever created in a genetics laboratory. It's taken over buildings, labs, fighter craft...even people! And it's getting bigger...meaner...with each passing second. But it hasn't taken over you. Now, you're going in on a mission to deliver Power Strike! You have a special attack ship with the ability to use weapons you free from the ground. The action is hot and heavy. The enemy is coming faster than you could ever believe! So fight hard and fast. If you don't turn the mutant vegetation into a giant tossed salad, they'll turn you into toast! 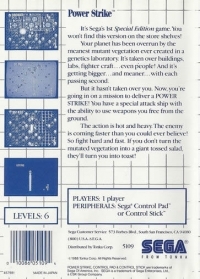 08-13-2014 critter7405 Box Text It's Sega 1st special edition game. You won't find this version on the store shelves! Your planet has been overrun by the meanest mutant vegetation ever created in a genetics laboratory. It's taken over buildings, labs, fighter craft...even people! And it's getting bigger...meaner...with each passing second. But it hasn't taken over you. Now, you're going in on a mission to deliver Power Strike! You have a special attack ship with the ability to use weapons you free from the ground. The action is hot and heavy. The enemy is coming faster than you could ever believe! So fight hard and fast. If you don't turn the mutant vegetation into a giant tossed salad, they'll turn you into toast! 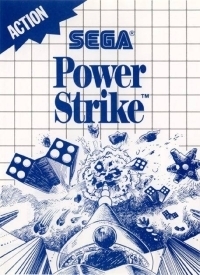 This is a list of VGCollect users who have Power Strike in their Collection. This is a list of VGCollect users who have Power Strike in their Sell List. This is a list of VGCollect users who have Power Strike in their Wish List.